A new synthetic model of the time-variable gravity field of the Earth suitable for satellite gravity mission simulation studies is now available. 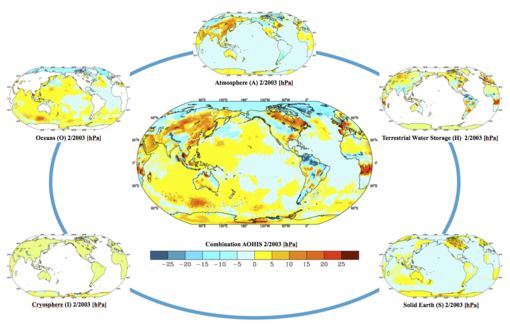 The model is an update of the ESA Earth System Model as described by Gruber et al. (2011), and is also given in spherical harmonics up to degree and order 180 for the years 1995 to 2006 with a time sampling of 6 hours. File formats and conventions follow the ICGEM standards. Dobslaw, H., Bergmann-Wolf, I., Dill, R., Forootan, E., Klemann, V., Kusche, J., Sasgen, I. (2015): The updated ESA Earth System Model for future gravity mission simulation studies. Journal of Geodesy, Vol. 89, p. 505-513, doi:10.1007/s00190-014-0787-8. Dobslaw, H., Bergmann-Wolf, I., Forootan, E., Dahle, C., Mayer-Gürr, T., Kusche, J., Flechtner, F. (2016): Modeling of present-day atmosphere and ocean non-tidal de-aliasing errors for future gravity mission simulations. Journal of Geodesy, 90, 5, pp. 423-436, doi:10.1007/s00190-015-0884-3. Dobslaw, H., Bergmann–Wolf, I., Dill, R., Forootan, E., Klemann, V., Kusche, J., Sasgen, I. (2014): Updating ESA’s Earth System Model for Gravity Mission Simulation Studies: 1. Model Description and Validation. Scientific Technical Report 14/07, GFZ German Research Centre for Geosciences, doi:10.2312/GFZ.b103-14079. Bergmann–Wolf, I., Dill, R., Forootan, E., Klemann, V., Kusche, J., Sasgen, I., Dobslaw, H. (2014): Updating ESA’s Earth System Model for Gravity Mission Simulation Studies: 2. Comparison with the Original Model. Scientific Technical Report 14/08, GFZ German Research Centre for Geosciences, doi:10.2312/GFZ.b103-14088. Bergmann-Wolf, I., Forootan, E., Klemann, V., Kusche, J., Dobslaw, H. (2015): Updating ESA’s Earth System Model for Gravity Mission Simulation Studies: 3. A Realistically Perturbed Non-Tidal Atmosphere and Ocean De-Aliasing Model. Scientific Technical Report 14/09, GFZ German Research Centre for Geosciences, 62 p., doi:10.2312/GFZ.b103-14091.